A Tesco shopper has hit back at the store’s customer service staff who ridiculed her for thinking that a vole she found asleep in a bag of oats was a mouse. 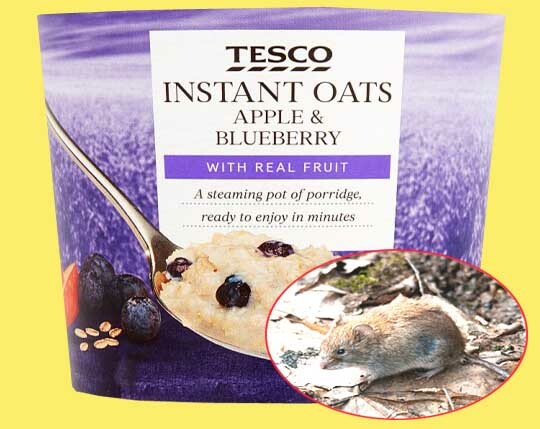 Clematis Owens, from Ipswich, was disgusted to find what she thought was a mouse inside a pack of Tesco Instant Oats. The 37-year old graphic designer was even more shocked by the reply she received to her emailed complaint and attached photo. I have on my screen your report and you’ll be relieved to learn that the creature is quite obviously not a mouse but is in fact Myodes glareolus, referred to more commonly by the less educated as a ‘bank vole’. The specimen you have received appears to be a female, aged between 12-15 months and, judging by the sheen of its coat and bright eyes, in extremely good health. It may also interest you to know that Myodes glareolus is indigenous to the UK, lives for 3-4 years and is mostly herbivorous, favouring a diet of bark, leaves and whenever possible rolled oats with fresh apple or blueberry, ideally both. I appreciate that my clarification doesn’t make the discovery any more pleasant but hopefully your fears associated with it possibly being a mouse have been quelled. Please would you return the creature (alive if possible) to the address given above, using the special humane transit box I am sending you.